FIGS. 30-33. (Fig. 26-29). 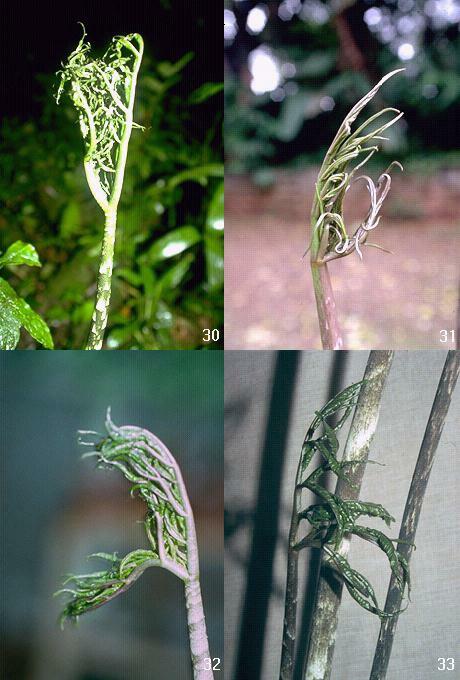 Early leaf blade development of Dracontium. 30. D. gigas (Zhu 1155), all divisions aggregated and pointing upwards. 31. D. margaretae Bogner (Zhu 1533). 32. D. asperum K. Koch (Zhu 1445, photo by Petra Malesevich, 1992), divisions separate, the middle division pointing up and the lateral divisions pointing downwards. 33. D. spruceanum (Croat 71852, photo by Thomas Croat).